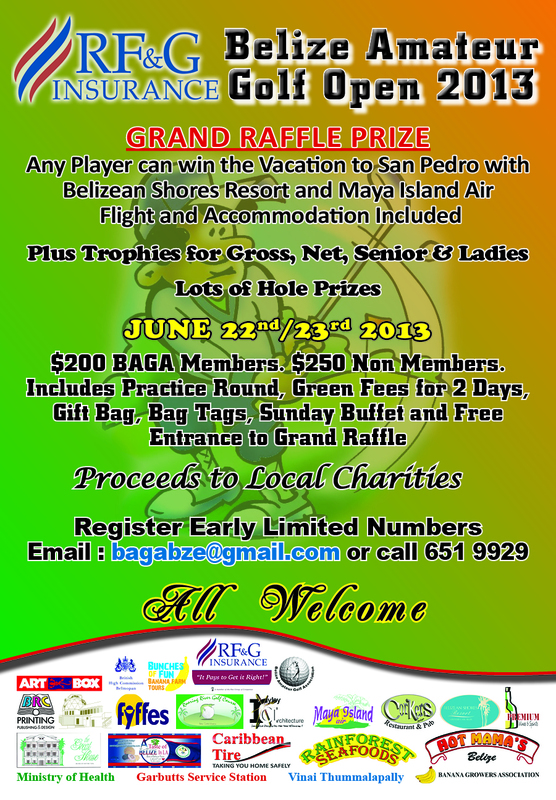 RULES OF RF&G BAGA 2013 Belize Amateur Open. HANDICAPS : Calculated using USGA HDCP system using an Average of the best 10 scores from your most recent 20 Roaring River Course scores based on the course rating of 66 (NOT the par 64). ALL Players HDCPS are lower than their course average. Players who do not provide last 20 scores will be assessed manually by the HDCP committee. i. Example : a score of 73 is actually 73-66 = 7 x 96% = 6.72 Handicap Index. 2 Day Stroke play tournament. Free Practice Round on Friday after 12pm. 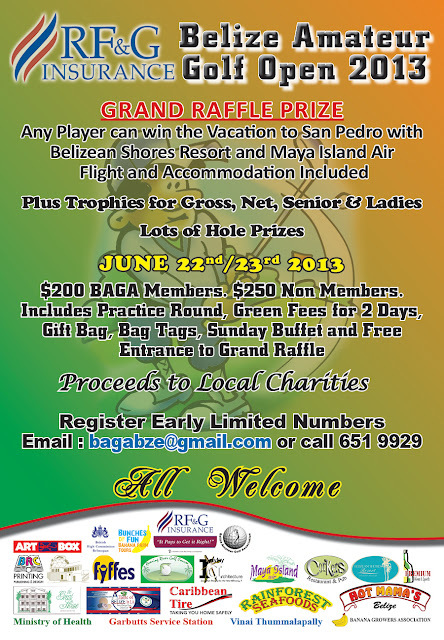 $200.00 entry BAGA Members. $250.00 entry Non-Members. Registration closes Friday 21st June at 3pm. NO Registration on Saturday. NO REFUNDS. Groups will be drawn on Friday afternoon when registration has closed. Start time to be advised. Players responsibility to check with committee for their start time. NO PRACTICE on the course Saturday or Sunday. Sunday players groups. Groups will be based on Gross Scores. All Players starting from Hole #1. Played by R&A rules with RRGC local rules applying. Balls to be played as they lie, EVERYWHERE on the course unless advised by committee on the day. Only exceptions are : i) All Ditches on right side of Holes #8, #9, #17,18. 1 Club length no nearer the hole. Free Drop. Ditch on right side of #9 #18 balls after the painted white rock next to the last Coconut Tree is in bounds and must be played as it lies ii) Balls in bunkers, only where players ball or stance is impeded by a Rock. Free DROP - 1 Club Length Inside Bunker no nearer the hole. iii) Temporary Immovable Obstructions (signs, picket fences). Move the Obstruction, NOT THE BALL. NO FREE DROP. REPLACE SIGN OR PICKET FENCE AFTER SHOT. iv) Tents and Bridge (#9/#18), Nearest Point of Relief + 1 Club Length no nearer the hole. Free Drop v) Balls that drop into irrigation pipes or Valve Bank next to #6 green. Nearest Point of Relief + 1 Club Length. Free Drop. vi) Drop Zone for balls in water hazard on #8 and #17. Option to use Drop Zone or hit from the previous position. vii) Any doubt on a ruling, play 2 balls until the end of the hole. Inform Committee immediately after round. Keep your speed of play at an acceptable pace. (Allowance 12 minutes per hole is more than enough. Each group will be issued a time guide). Be ready to play when it is your turn. If the group behind you is waiting please pick up your pace. If you fall more than 1 hole behind the group in front of you let the group behind pass through. Only players attending the award ceremony on Sunday will be eligible for the Grand Raffle prize. A player will not be eligible to win trophies/prizes in more than one of the categories. Gross, Net or Senior. Awards of Trophies will be based on scores in order of 1st Gross, 1st Net, 2nd Gross, 3rd Gross, 2nd Net, 3rd Net, 1st Senior. 1st, 2nd, 3rd Place ties (Net, Gross, Senior) will be decided by sudden death play off, starting at Hole #9, then proceeding to 15,16,17,18 until a player wins a hole. All other ties will be decided by best back 9 score on Sunday, then best back 9 on Saturday. If still tied, best score from 15-18 on Sunday. Then best total score from 15-18 on Saturday. If still tied count back from hardest HDCP Hole onwards on Sunday. Decision of Organizing Committee is final. Paul Martin, Steve Hack, John Sansone, Andy Hunt. Check with Paul Martin at the Roaring River Golf course for permission to use Caddies. BAGA members this is a double points tournament. carries remarkable and actually excellent information in support of visitors.